Thomas Weston Miln was a flax merchant in Dundee. Having retired from business in the 1840s, he devoted his time to being active in good works for the community. He was the first to employ Bible women in Dundee. Western Cemetry, Tablet Stone West Wall. As a young man, Thomas Weston Miln was, for many years, a flax merchant in Russia. Links with the trade were perhaps already established as his father, Robert Miln, had also been employed as a flax merchant. Thomas came to Scotland and settled in Dundee where he carried on a business as a merchant, firstly in the Cowgate. 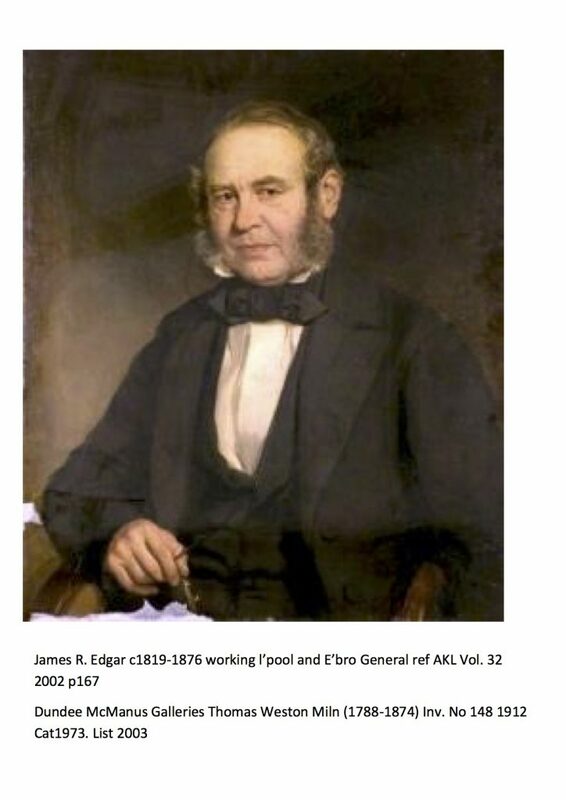 He retired from the business in 1848. George Armitstead was said to have succeeded to his business. 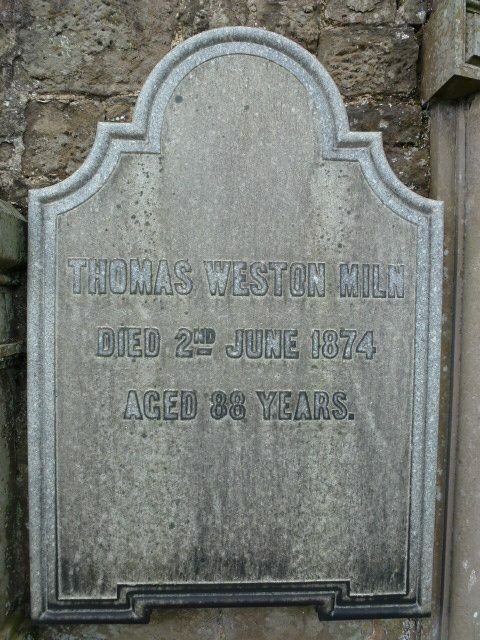 From 1848, Thomas Weston Miln's life was dedicated to practical philanthropy, having been involved with a great many causes and institutions in Dundee. Thomas Weston Miln, a son of Robert Miln (flax merchant) and Gretchen Klatzo, was born in Riga. Another son, Robert, also became a flax merchant, living eventually at Viewfield in Arbroath. From 1848 when Thomas retired from business, he devoted his life to doing good. There was scarcely an institution in Dundee in which he did not take an active part. In some of them, it was said, he took on the work of the whole committee. At the Parochial Board he was also, at one period, of great service and gave much time and attention to having the Poorhouse opened and its management placed on a satisfactory footing. Some years ago, hearing of the good that Bible Women were doing in some of the cities in England, he succeeded in getting his minister, the late Dr. Adie, together with some of the leading members of the East Church, to take up the cause as a congregation – the first Congregation to employ Bible women in Dundee. The Model Lodging House Association in Dundee (being safe residence to those in need) shared largely in his attention. He was deeply interested also in the general lodging houses of the town and was in communication with the Sanitary Inspector whose duty it was to visit these houses. Mr. Miln took a great interest in the moral and spiritual welfare of the sailors belonging to the port and was, for many years, Chairman of the Committee of the Seamen’s Friendly Society. Mr Miln was instrumental in getting up a Sailor’s home, on which he spent a good deal of time. Its success was hindered through a lack of sailors requiring to make use of it as most had homes or relatives in the town. Described as having been of a quiet and unostentatious character, Thomas Weston Miln’s true hearted and earnest approach to charitable ventures was to the benefit of many. The information above about Thomas Weston Miln has been collated from a range of digital and hard copy sources. To the best of our knowledge it is correct but if you are relying on any information from our website for the purpose of your own research we would advise you to follow up the sources to your own satisfaction. If you are aware of an inaccuracy in our text please do not hesitate to notify us through our Contact page.